People feel alone, separate, misunderstood, because they are trying to relate to other people on a human level, on a physical level, when the key to eliminating loneliness and finding your place in the world is to accept and love yourself, to relate to others on a spiritual or energetic level, and to understand that you have a place in the universe. On Loneliness is a collection of messages I channelled from the angelic realm over a period of two years. This book is on loneliness, the human search to avoiding it, and the true, healthy way to eliminate it from your life. On Loneliness is for everyone, for you. Read it as you will, at your pace, at your comfort. Enjoy the messages, the words, the semantics and the rhymes. Let every part vibrate and connect with you, at whatever level it does so, for it will, at some level. Draw from it what you will, in the time and space that you are. Perhaps these messages will bring you new insight, perhaps they will reinforce what you already know, or believe. But know this, be assured, that all these messages are for you, are of your truth, of your core as a being. Breathe them in, and let them inspire you to be who you have always wanted to be, with the knowledge that you are always cared for, watched over, and NEVER alone. Special thanks to Claire Lamonde for the artwork Faithful Companion which was used for the book cover. 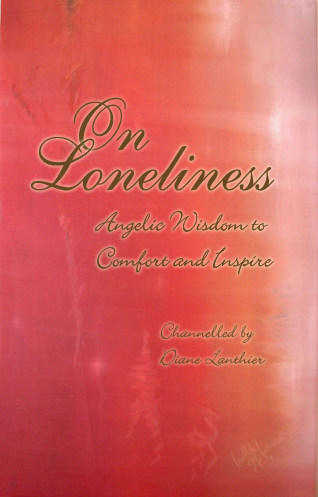 * To purchase your electronic copy (EBOOK) of On Loneliness and make your payment easily and securely use the buy now Paypal button below. Once your payment has been completed, the ebook (pdf format) will be sent to the email address used to make your paypal payment within 24 hours following payment. The price of the EBOOK is $5.55 cdn. A Kindle version is also available on Amazon!